Can a Phone Become Your Digital Wallet? Back in 2006 I was fascinated (and a little jealous) when I read that shoppers in Japan could pay for a soda by waving their cell phone at a vending machine. Since then I've been impatiently waiting for this handy pay method to spread to the United States. So when the technology that makes it possible--Near Field Communication--started being discussed again recently, I got hopeful. If you work in a building that requires you to wave a card to gain entry, you have an idea of how NFC works. That card has an embedded circuit with your permissions encoded. Similarly, NFC--a high-frequency wireless communications technology--allows the exchange of data between devices at a maximum distance of about 4 inches. 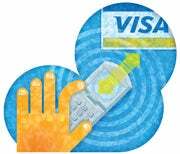 Users wave or tap their mobile phone against a reader and then enter a PIN on the handset to verify a purchase. A clutch of tech giants recently issued announcements that made me optimistic. Nokia says that all of the smartphones it introduces this year will have NFC capability. All phones using the new 2.3 version of Google's Android operating system will be NFC-capable, too. And AT&T Wireless, T-Mobile, and Verizon Wireless have formed ISIS, a joint venture to develop an NFC mobile payment system. Google also is testing NFC technology in Portland, Oregon, as part of its HotPot location-based recommendation service, in which you rate Google Places-listed businesses in a method similar to that of Yelp. You then start getting recommendations in your search results for things that Google thinks you will like based on the preferences that you've stated. In the Portland tests, if a business links itself to its Places page, it may request a kit from Google that contains a "Recommended on Google" decal with NFC tech built in. Smartphone users can touch their device to the sticker for more info. And the NFC Forum, which works to promote the use of the technology in consumer electronics and mobile devices, had interesting entries in a contest for ideas on how to use NFC. One was the Smart Poster: Imagine touching your phone to an NFC-enabled poster and immediately receiving something such as a movie trailer or a discount coupon. Sounds like fun, right? Here's the bad news: Although devices may have the capability, we won't see it in action anytime soon. Avi Greengart, research director for consumer devices at Current Analysis, told me: "NFC could be extremely useful as secure ID or a payment mechanism. In fact, we already use NFC in some credit cards and keyfobs. The technology isn't the issue--it's getting the technology widely deployed with consumers and, at the same time, ensuring the infrastructure for accepting payments is upgraded to match. This chicken-and-egg problem is unlikely to be resolved this year." Mobility expert Bob Egan agrees: "The noise around NFC will be very big in 2011, but the transactions, by volume and amount transacted, will be very small." I'm a Droid user, though. So even if Apple jumps on the NFC bandwagon, I'll still be hoarding unwrinkled dollar bills for a while--just so I can get my ginger-ale fix from the basement vending machine.